This is my effort from art class the last week of the dancer pose. I erased and redrew my picture 3-4 times, totally unsure of what I wanted. Finally wound up with this, but difficult as always with life drawing, as each time the model would get up and sit down again there would be so many changes. 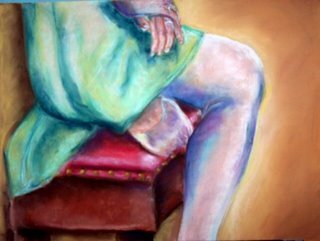 The flow of her skirt was never the same, nor was the foot she was sitting on.